Nanomaterials for Biological and Medical Applications explores the different applications of carbon nanomaterials in drug and gene therapies and their use in tissue regeneration, biosensor diagnosis, enantiomer separation of chiral drugs, extraction and analysis of drugs and pollutants, and as antitoxents. 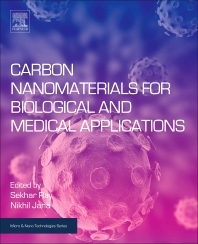 The book describes the synthesis processing of carbon nanomaterials, carbon composite nanomaterials, and their different biological and biomedical applications, including the removal of biologically toxic materials, optical biosensor applications, bio-imaging probe, drug delivery, cancer treatments, and other biomedical applications. Sekhar Chandra Ray is Professor of Physics at the University of South Africa, specializing in Experimental Condensed Matter Physics. His research focuses on carbon nanostructure materials on bio-imaging processes and photovoltaic materials. He has published 78 peer-reviewed research articles, with more than 1100 citations in internationally recognised journals. Nikhil R. Jana is Associate Professor at the Centre for Advanced Materials, Indian Association for the Cultivation of Science, India. His research interests focus on using nanoparticles and surface chemistry for biomedical applications.